He can reach speeds of around 200 miles per hour and while he used to belong to a drug trafficker for a Mexican drug cartel, the 2007 Chevy Corvette Z06 dubbed “Coptimus Prime” now belongs to the New Braunfels Police Department in Texas. The La Familia Michoacana, who authorities estimate brought in about $4.5 million each month, was responsible for distributing about 25 pounds of methamphetamine monthly. The meth was close to 100-percent pure and had a street value upwards of about $20,000 per pound. Along with Coptimus Prime and methamphetamine, authorities also seized high-caliber guns and other assets with a total value of around $500,000, including more than $140,000 in cash. 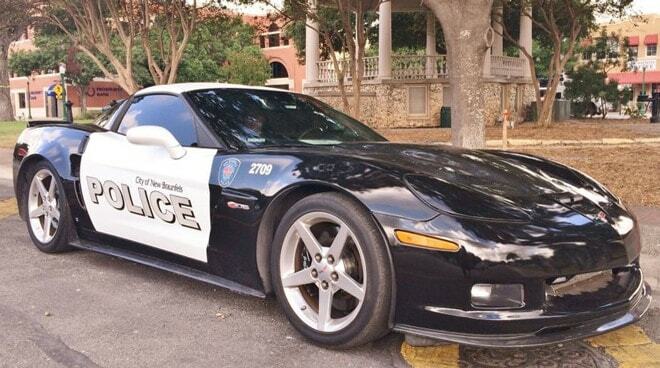 “I think it acts as sort of a driving billboard that says ‘crime does not pay,’” New Braunfels Police Department spokesman David Ferguson said of Coptimus Prime, which was given his name at the suggestion of civilians on the department’s Facebook page.